A Chicago widow accused a major drugmaker of causing her husband's suicide and failing to warn the public about known side effects of a commonly prescribed drug. Lisa Parker reports. A Chicago widow accused a major drugmaker of causing her husband's suicide and failing to warn the public about known side effects of a commonly prescribed drug. A federal jury of nine men and women said the drug paroxetine, commonly known by its brand name--Paxil, was to blame for the death of a successful Chicago attorney and family man who committed suicide suddenly one summer day seven years ago when he stepped in front of an oncoming Blue Line CTA train. The six-week case included a mountain of scientific evidence about this drug routinely prescribed to treat anxiety and depression. Plaintiff Wendy Dolin argued her husband Stewart suffered a deadly Paxil side-effect called akathisia, known to drive some to sudden and violent suicide. Her suit accused drugmaker GlaxoSmithKline of withholding crucial safety information for years from both the government and from the public--failing to adequately warn adults of these risks. "The jury's verdict is very clear that the label as it still stands today is deficient. It does not have a warning in it that the drug cases suicide for people who are over 24," said attorney David Rapoport. Late Thursday afternoon, the jury sided with Dolin, awarding her $3 million. "Of course it's been extraordinarily bittersweet," Dolin said. "This has been years of fighting and raising awareness." 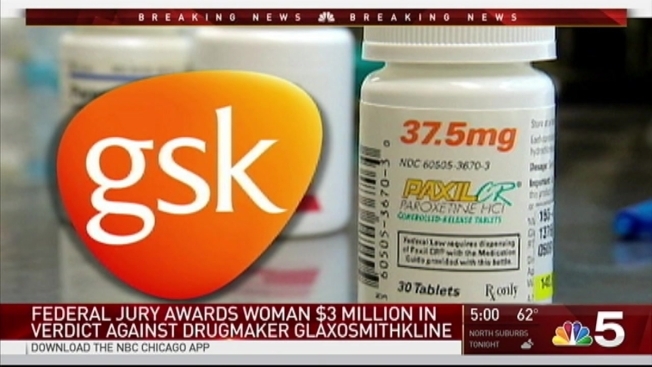 In a statement, GSK says it is disappointed in the outcome and will be filing an appeal. Gsk maintains that because it did not manufacture or market the medicine ingested by Dolin, it should not be liable. Additionally, the Paxil label, GSK says, provided complete and adequate warnings during the time period relevant to this lawsuit. This case was closely watched throughout the legal and pharmaceutical worlds. It is believed to be the first time a plaintiff successfully sued any brand-name drug maker for a side-effect connected to its generic alternative.